The SUN is one NATURAL Radiation that is REQUIRED; learn How to USE it. Man Made Radiation MUST be Examined and Avoided or Minimized if Harmful; Almost ALL is HARMFUL. Less Sun MORE Breast Cancer Note the farther north you live the LESS sun and vitamin D you get from the sun. You can get Vitamin D from sun tanning beds and Vitamin D3 supplements ANYWHERE at ANYTIME. "But on to the task at hand. 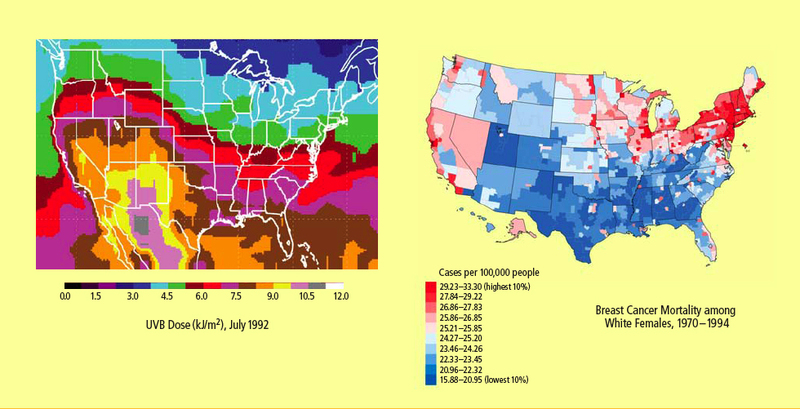 Let me begin with these two maps... the one on the left shows the amount of UVB radiation received across the nation, and on the right is a map of breast cancer prevalence. There are maps like this for all types of cancer, and they all show similar patterns. ... They're strikingly similar. Areas with more UVB exposure, the type of sunlight that your skin uses to make vitamin D, tend to have lower cancer rates." The SUN is one NATURAL Radiation that is REQUIRED; learn How to USE it Man Made Radiation MUST be Examined and Minimized if Harmful; Almost ALL is HARMFUL. Radiation is all around us penetrating our bodies 24x7x365. Until the last couple hundred years most radiation was natural; mostly the sun. Contrary to CDC induced popular belief the sun does NOT cause most melanoma, the serious skin cancer. The sun is the sole source (over 90%) of the CRITICAL Vitamin D for most of us. Learn how and WHY to safely get your REQUIRED sun exposure. Man Made Radiation has increased by about one million times in the last couple of hundred years. This is AFFECTING our bodies in a very negative way. There has been virtually no Scientific Peer Reviewed Clinical Testing of most of this new technology. We have all kinds of good evidence that much if not most of this man made radiation is very HARMFUL to our bodies; especially WIFI and "smart" technology. Please take a good look at the evidence presented in this protocol and take action to eliminate all of the risk you can. The simple primal act of getting noontime sun on your bare “unprotected” skin in large amounts just may be the most important single thing you can do for your health IMO. “Every 8 minutes another American dies from cancer caused by insufficient sunshine.” Doctor David G. Williams MD Note it is not just cancer that is being caused by insufficient sunshine; I could run the numbers but you would not believe me; lets just say it is far greater than one a minute. Vitamin D Deficiency Increased the Risk of Heart Failure by over 12 Times; yes Twelve times! Folks this is off the charts; please contemplate this and GET OUT in the SUN! The standard Medical Treatment for TB used to be and should be NOW, THE SUN. Please take a good look at Mother Sun and your NEED for it. When good honest government staffers, working for the public, are forced to put the public's health in jeopardy or lose their job you KNOW something is terribly wrong. The Rockefeller and Rothschild clans have their hooks so deep into the Medical Industry and GOVERNMENT it is a wonder the Industry and GOVERNMENT is not cut in half. You might say they have been functionally cut in half. This is the reason no honest health related testing is never done on the new RF technology. They use the results of IONIZING Radiation testing done three or four decades ago before the new NON-IONIZING RF technology existed. They throw away any testing that shows a danger to the patients or the medical personnel running the technology machines. Those TSA Radiation machines in the Airports that have irradiated BILLIONS of human bodies, many of us hundreds of times, HAVE NEVER BEEN HONESTLY TESTED. Of course you can say the same thing about "smart meters" and "cell phones" and all the "smart technology". Older immunocompromised individuals often die within weeks of the installation of a "smart meter". Of course this is merely a "coincidence"; just as your child becoming Autistic directly after his MMR "vaccine" injection is a coincidence and your nose bleeding after I punch you in the nose is a coincidence and there are three, four or 147 genders. Folks believe none of this bs; please THINK. Massive Spy Grid Has One Weakness blood stacking effects. can cause anemia from damaged red blood cells; lack of oxygen delivery to your cells; thus it can cause cancer and many other diseases. Science has progressed immensely with looking at blood analysis and oxygen transportation, disease and healthy blood. We can literally look at blood and tell the difference between healthy and unhealthy blood. Exposure to "smart meters" produces unhealthy blood. Period! The closer you are to the "smart meter" the greater the damage. "smart meters", often banks of many dozens of "smart meters" are being installed within a couple of feet of people's sleeping heads. Even at 90 feet there is damage. Please examine these "smart meters" well and DECIDE they cannot live in your home. "Other research has been done that reveals lower frequency microwaves used by cell phones and Wi-Fi cause some harm to DNA over time as well.” Single- and double-strand DNA breaks in rat brain cells after acute exposure to radiofrequency electromagnetic radiation. Cell Phone Tower Radiation Documented Serious Health Problems including a 900% increase in some cancers indicating DNA breakage, This relationship was mathematical the closer to the tower the more cancer. With 5G EVERYONE will be near a tower. Wi-Fi Radiation the Wi-Fi RADIATION in your HOME just keeps growing and growing folks, this is NOT GOOD. I have NONE. The PLAN is to slowly FRY us. As you can see be very careful with Radiation especially Wi-Fi, "smart technology" and Medical Radiation. Your wonderful Cell Phone and its infrastructure, especially the new 5G Infrastructure located a few meters from your body 24x7x365 if you live in a city. "Smart Meters" and other Radiation is also to be avoided. ALL radiation is to be minimized if not avoided. Electric Power is to be contained in WIRES and not blasted into our bodies. Yes the current being blasted into your body is a small amount BUT your body is running on smaller amounts of current. Your body is among other things, running on extremely small electrical currents. Please Watch this Video to get a Glimpse of some of the Serious Health Problems with EMF and "smart meters"
Folks electronic power belongs INSIDE WIRES. The widespread trend to WIRELESS has been a disaster for our mitochondria, the human body and all living creatures. You MUST realize no one is going to protect you from this deliberate menace but YOU. IMO none of this is accidental. Many people believe many disease rates are going to at least double from here. The Build out of the 5G wireless system is going to bombard almost all of us in cities with many times the EMF we are are currently being bombarded with. Cell phones, smart meters, area networks as well as your home wireless set up are all contributing to shooting radiation into and through your body. Measure, protect and measure again to test the efficacy of your protective measures. Generation of stress proteins damaging stimuli. So we’re looking at possibilities of many skin diseases and cancer as well as physical pain to our skin. CFL lights are of course mercury bombs with their 10 mg of mercury in every bulb. The EPA considers a CFL bulb breaking a "Hazardous Materials Emergency Event". This should tell us everything we need to know about the politics of "political correctness". These CFL bulbs were foisted on us and are IMO a DISASTER. Please have NONE in your home. Led Lighting & the A.I Take- Over of Man Kind & Morgellons! Blue light from the sun and our numerous electric devices can damage your eyes. 10 to 20 mg of lutein and zeaxanthin/day can help keep this damage under control. Make sure your sunglasses protect against UVB as well as UVA. Blue light and Morgellons Disease may be playing a very important of the take over of the human race by evil people. LED lights emit blue light and thus are not a good choice for home lighting. I have looked long and hard about the choices in home lighting and have decided I will only use Incandescent lighting. Most other forms of lighting have serious problems. WIFI is rapidly replacing many communication methods. One problem with wifi is that it blasts POWER into your body, brain, blood cells, bones and everything else in your body. Your body is not DESIGNED for this man made assault and reacts and recovers poorly. MANY DISEASES result from this man made assault. Your body runs on very small electric currents and thus very small man made currents can disrupt your body. Please do not subject yourself, your spouse, your children and beloved pets to wireless devices to include smart meters, WiFi, portable phones or WIRELESS devices of any type in your home. The master plan is to suffuse your HOME with so much WIFI you do not have a chance. It's Called The 5G BEAST SYSTEM For A Reason (2018) Note how the PTB intend to IRREDIATE us to ill health and a premature death; not to mention a lot of DAILY misery and ill health. 5G Technology is Coming – Linked to Cancer, Heart Disease, Diabetes, Alzheimer’s, and Death Note The Safety of 5G Has Not Been Tested. The EVIDENCE of its HARM is beyond HORRIBLE. The Build out of the 5G wireless system is going to bombard almost all of us in cities with many times the EMF we are are currently being bombarded with. What saved most of us in the 3G and 4G eras was that the BROADCAST TOWERS were far away from most of us. With 5G the BROADCAST TOWERS are near the bedrooms and daily living space of MANY of us. If you live in a UN Agenda 20/30 BIG City Stack and Pack you WILL be 5G irradiated. Even in the suburbs you will be 5G irradiated. Brain cancer has now surpassed leukemia, which itself is linked to radiation, as the number one cancer killer in children. IMO this trend will start marching up the age ladder in coming years. Electromagnetic radiation absorption rates are much higher in a young child’s brain than in an adult’s. Electromagnetic radiation from a cell phone can travel through the entire brain of a 5-year-old child, exposing his entire brain to damage. Children Should Never Use Cell Phones: Barring a life-threatening emergency, children should not use a cell phone, or a wireless device of any type. Children and PETS are far more vulnerable to cell phone, wireless and other radiation than adults, because of their thinner skull bones and smaller brains. Please do not subject your yourself, your spouse, your children and beloved pets to wireless devices to include smart meters, WiFi, portable phones or WIRELESS devices of any type in your home. The master plan is to suffuse your HOME with so much WIFI you do not have a chance. WE the PEOPLE have to REJECT "smart meters"
"Smart Meters", "Smart Devices", "Smart Grid" and "Smart Cities"
Any technology with “smart” in the name is almost certainly BAD for you. The reason they use the word “smart” is because who can be against “smart”? Well you had BETTER be IMO. "Smart Meters" can be 100s of times more deadly than cell phones. Why? "Smart meters" broadcast 24x7x365 at a median rate NOW, it will soar, of 10,000 transmission/day. Each of these transmissions can harm you, often grievously. Each broadcast essentially saturates your entire home and often much of your neighbors home; the closer you are to the "smart meter" the more damage done to your body. For God's sake do not sleep near one of these monsters. Children and PETS are far more vulnerable to cell phone, wireless and other radiation than adults, because of their thinner skull bones and smaller brains. Please do not subject yourself, your spouse, your children and beloved pets to wireless devices to include smart meters, WiFi, portable phones or WIRELESS devices of any type in your home. The master plan is to suffuse your HOME with so much WIFI you do not have a chance. This massive proven very dangerous government (at all levels Global, National, State, Regional and Local) blessed technology is being replicated all over our Country and indeed the whole WORLD WITHOUT Scientific Peer Reviewed TESTING. This is an important health and freedom issue and much, much more. Once again we see The Powers that Be bless a concept and RAM it THROUGH without following science, safety, common sense or even humanity. In my mind it is impossible they do not know this "smart" technology is killing and harming Billions of people. They KNOW and yet are still implementing it. Why? “Medical radiation is a highly important cause (probably the principal cause) of cancer mortality in the United States during the Twentieth Century. Medical radiation means, primarily, exposure by xrays (including fluoroscopy and CT scans). Medical radiation, received even at very low and moderate doses, is an important cause of death from Ischemic Heart Disease; the probable mechanism is radiation-induction of mutations in the coronary arteries, resulting in dysfunctional clones (mini-tumors) of smooth muscle cells.” Radiation from Medical Procedure in the Pathogenesis of Cancer and Ischemic Heart Disease Note this means NO, NONE not at the doctors not at the dentist not at the airport unless the risk/reward is shown to favor the radiation. Make the doc give you the hard numbers. Land of the free home of the brave, right. They know folks, they know. Please become an informed consumer of Medical Radiation; almost ALL of it is UNNECESSARY. Therefore the RISK you are incurring by ZAPPING yourself is totally unnecessary. Children and PETS are far more vulnerable to cell phone, wireless and other radiation than adults, because of their thinner skull bones and smaller brains. Please do not subject yourself, your spouse, your children and beloved pets to wireless devices to include smart meters, WiFi, portable phones or WIRELESS devices of any type in your home. The master plan is to suffuse your HOME with so much WIFI you do not have a chance. Please do not be ignorant of any medical radiation Risk you may be asked to RISK. Make sure any possible benefit exceeds this risk. This woman is an excellent researcher, we need many more like her. Morgellons is a somewhat mysterious disease. There is evidence that radiation, perhaps in the form of blue light is involved. Just what is Morgellons disease? Victims report, these reports have been confirmed by medical professionals, fiber like strands poking out of their skin. Often victims report parasitic like creatures. IMO these fibers and "parasites" may be the result of the bio-weapons attacks upon us coupled possibly with our GMO toxic food supply and perhaps our pharmaceutical drugs or the electromagnetic radiation we are receiving at a rate millions of the times that our grandfathers received. There are ways to protect yourself, please do. Folks very little in the health field is as certain as NOT having a microwave monster in your Home. Many herbs, supplements and actions can help you recover from Radiation exposure. Please become aware of them. Consuming this radiation protection before and after your exposure to radiation will have MANY other benefits for your health. So there is no RISK to this radiation protection and recovery.